2013-14 has been a most memorable academic year for all of us. We started the school year 2013 with the screening of the documentary film on the Maryknoll sisters, Trailblazers in Habits. Through this film, many hearts were touched by the fathomless love and dedication the sisters had poured on people they served. Another screening for our whole school was held, as we have the mission to carry forth the sisters’ legacy. How will we follow their lead and continue to trail blaze? 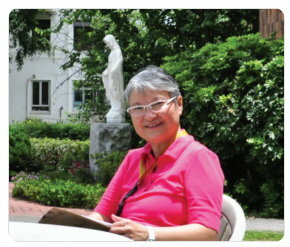 We have remembered the loss of three Maryknoll Sisters who have served in our school – Sr. Rose Duchesne, former principal of the secondary section and supervisor of the primary section; Sr Agnes Cazale, our former supervisor and Sr Agnes Christine Welscher, former vice principal of the primary section. They had lovingly taken us into their fold, and accepted us as their family, and we will remember and treasure them in our hearts. Sr. Rose had said, “Free to be myself, happy to be what The Lord has given me to be.” May we also take these into our hearts and enjoy whatever comes our way. This year we have invited Mr. Archie McGlynn to conduct a Critical Friend Review on the school, and he has observed and met with teachers, staff, students, former students and parents. In his report, he was pleased to affirm that the Maryknoll spirit is very much alive in the school, and that we are “...high performing in a whole range of ways and are, in my view, one of the top performing schools”. He also noted that “the girls are, for the most part, free-spirited, caring, confident and creative. They set high standards for themselves. The Prefects are enthusiastic, energetic and committed. They are superb role models. The Student Association is active, articulate and an asset to the school” (McGlynn, 2014). Pope Francis has recently said, “The memory of people is not a computer, but a heart. People, like Mary, keep things in their hearts” (A Year with Pope Francis, Rossa, (ed) , 2014, p. 171). We do often keep things in our hearts, and we become very attentive, caring and responsible in our behavior. We also become appreciative and reflective, lest we may forget. As the year draws to a closure, we look forward to celebrating the school’s 90th anniversary and enabling our students to pursue the Sisters’ vision of an all-round, holistic education based on Christian values.